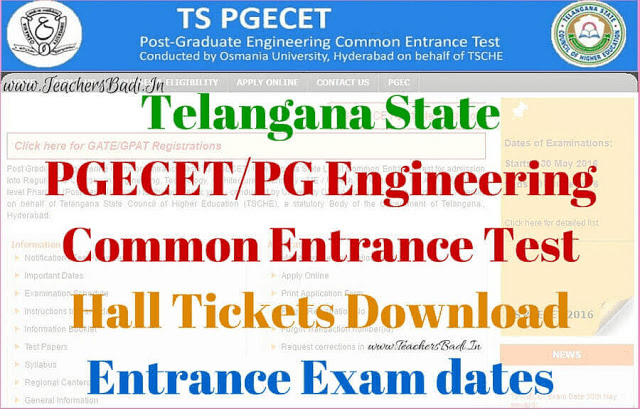 TS PGECET 2019 Hall Tickets, Exam dates, #TS Post Graduate Engineering Common Entrance Test (#PGECET) is Telangana State Level Common Entrance Test for admission into Regular PG Courses in Engineering, Technology, Architecture, Pharmacy (ME / M.Tech./ M.Pharmacy / M.Arch ), Graduate level Pharm-D (Post Baccalaureate) for the academic year 2019-2020 conducted by University College of Engineering, Osmania University on behalf of Telangana State Council of Higher Education (TSCHE), a statutory Body of the Government of Telangana., Hyderabad. Osmania University, Hyderabad issued the Post Graduate Engineering Common Entrance Test/ PGECET 2019 notification on March ...., 2019 and the OU invited the Online application from the eligible candidates for appearing post graduate engineering common entrance test 2019 for admission into ME/ MTech/ MPharm / MArch/ Graduate level Pharm D Full Time in University and Affiliated Engineering / Pharmacy Colleges in Telangana State for the academic year 2019-2020 from .....-03-2019 to ....-04-2019 and now Online applying process is going till upto ....-05-2019 with late fee of Rs. 10000/-. The candidates who were applied for this entrance exam stream, they are waiting for their hall tickets. The OU will upload the PGECET applied candidate's hall tickets on its official web portal. Candidates should keep their hall tickets while you are going to exam hall and it should be kept upto at the time admission. #Download the PGECET 2019 hall tickets from its official web portal http://pgecet.tsche.ac.in/ from ..-03-2019 to ..-05-2019 as per their schedule. The Common Entrance Test Committee on Saturday decided to conduct the Telangana State Postgraduate Common Entrance Test 2019 (PGECET) in offline mode instead of the online mode as decided earlier. The TSPGECET 2019 is a common entrance test for admission into full-time ME /MTech /MPharmacy/ MArch /Graduate level Pharm D (P B) courses offered in various universities and constituent and affiliated colleges in the State of Telangana. The meeting was convened to seek approval to conduct the test in offline mode instead of online mode. The test is scheduled for May .... The candidates may visit the official website of TSPGECET for the latest updates regarding the download of their hall tickets. The candidates are required to come to the examination hall with the correct hall tickets.